According to many, we exist today on the threshold of a "singularity" event, where advances in technology and how we relate to that technology will become so rapid and so widespread that in a matter of decades, some believe, human life itself may change so profoundly as to make it impossible for a person living today to understand an individual born fifty years from now. Our perspectives, our "grounding points" for understanding our evolving world, all of that will change so completely as to make it as difficult to comprehend past and present as it would be for homo habilis to understand Snooki from Jersey Shore. OK, maybe it'll be more difficult than that, but there are those who believe that we may be on the cusp of developing true artificial intelligences. How would these intelligences develop? What about the advances in computer hacking, in computer viruses and "worms"? What if instead of a world where a technological Garden of Eden may be emerging, what if we were instead living in the days of a new Plague? These latter questions are addressed in Brazilian writer Fábio Fernandes' Os Dias da Peste (or [In]The Days of the Plague in English), which was released in Brazil in late 2009. It is the story, told via Artur Mattos' journals, blog entries, and podcasts over a span of six years (2010-2016), of not just how the first AIs evolved, but also about our ragged and sometimes self-destructive interaction with technology. In these dozens of entries spread over 183 pages, Fernandes explores how intertwined we have become with our technologies. In a world where social networking has exploded over the past five years (after all, there will be several readers from around the globe who will recognize the name "Snooki" and have some concept of that person), problems do develop as much as wonderful solutions to the age-old problems of distance, language, and cultural barriers. Artur expounds upon these problems, such as viruses, trolls, and the limitations of communication, in several of his entries, many of which are insightful and which felt more akin to personal essays than a fictional monologue recorded on a blog or podcast. In reading several of these entries, I was reminded, not altogether favorably, of Dostoevsky's Notes from Underground, with its misanthropic character who questions the nature of the emerging society, although Fernandes' Artur is more sociable and the critiques here differ from those of that great Russian short novel. I raise this comparison not to praise or to condemn Fernandes' story, but to note that Artur is such an odd character (compounded by the utilization of blog/podcast-type versions of chapters) that at times it is difficult to connect with him. There were several times, especially when Artur was listing literally dozens of prominent philosophers and late 20th/early 21st century SF writers, that it felt more that Fernandes was just tossing in names to create an illusion of depth rather than trusting in Artur's character to develop those connections with societal concerns that the authors cited expressed in their writings. Unfortunately, there were several times in the reading of Os Dias da Peste where the narrative flow grinds to a halt while the reader processes paragraphs-long citations of Artur's (and perhaps Fernandes') favorite authors. In feel, if not so much in the actual dialogue, I was reminded of some of the earlier cyberpunk novels, which is not a surprise, considering Fernandes' background in translating of William Gibson and Bruce Sterling. This novel is not a straight-up updating of that narrative mode's concerns, although there are a few elements, particularly in the more direct discussions of how technology and human cultures have merged, where there is a sense of kinship to say a Neuromancer or Schismatrix. Os Dias da Peste also shares with these novels a sense of hesitancy over the direction that we are taking, that perhaps with the coming technological glories there may also lurk a Trojan Horse of new ills that may spoil everything. Fernandes explores this sense of unease in Artur's writings, but he wisely leaves things hanging in his conclusion to the novel. On the whole, Os Dias da Peste is a flawed novel. Although Artur was an interesting character, there were times that he seemed to "disappear" too much into the subject material of several of his entries. As noted above, there were times that the narrative flow was interrupted by the rather too copious citations of American (in this sense, mostly from the US, but a few from Brazil and Argentina) SF literature, some of which contained surprising errors (such as citing Cory Doctorow as a US writer, rather than a Canadian one). I sometimes had the impression that Fernandes did not "trust the story" as much as he perhaps should have, as there are several promising sections that do hint at a great novel. But on the whole, I felt as if there were a semi-opaque barrier between what I grasped and what I sensed the story was moving toward. Perhaps the language barrier could be behind some of this (although my understanding of written Portuguese is near that of my knowledge of Spanish now), but I believe this "barrier" deals more with the perceived flaws with the story execution than anything else. 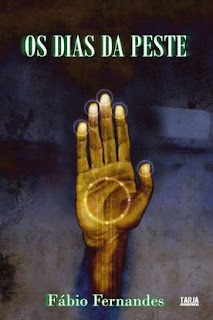 Os Dias da Peste thus is a novel that contains some interesting ideas, but its flawed execution of those ideas make it less than the excellent novel it could have been. I would recommend it for those who enjoy cyberpunk and more "hard" SF literature if it were available in English, but my recommendation cannot be as effusive as I wish it could have been. It's not available in English? That's too bad - I was fascinated by your review. I've only read about the singularity theory on Wikipedia and it sounds so intriguing. No, it's only available in Brazil right now and Fábio himself sent me a review copy. Some of his fiction is starting to be published in English, however. Maybe in the near future his longer fiction will be available as well. Despite the conflicted tone in my review, I think there is an audience for the sort of fiction he's writing, even if some of the descriptions (such as Orkut being emphasized more than Facebook) are oriented more toward Brazil than toward a US audience. Thank you very much for your excellent review, Larry. Accurate as always, you pinpointed exactly the flaws of my novel. And you're right: Os Dias da Peste is really very much oriented toward a Brazilian audience. I'd probably have to rewrite it more than 75%, because even I am no longer satisfied with the result. I'm glad this review was of some service to you, even if it did just point out some weaknesses that you suspected were there. Still want to read parts two and three whenever they are released. I wanted to send you my next book, but I think it is not a good idea (fear! ).